Why aren't more retailers offering customization? As I see the success of customization at retailers such as Build-A-Bear, I wonder why other retailers haven't engaged in more extensive efforts to provide customization experiences in their stores. With the web disrupting brick-and-mortar retail, I've argued on this blog that retailers need to get more experiential. Customization serves as critical component of an engaging retail experience. Certainly, one can customize over the web too. However, in some cases, brick-and-mortar stores can provide a more satisfying experience, in which one examines and chooses from various options and builds their own product. Retailers: putting yourself in kids' shoes! I visited a number of NYC retailers today with a group of sales executives from a major consumer products firm. I was struck by the contrast in how two firms approached children's products. At one retailer, a line of products appealing to kids sat well above the sight and reach of children. They were so high that i missed them until someone else pointed them out. At the Times Square Disney, on the other hand, we learned that managers walked around on their knees as they built the store to see it from kids' perspectives. They considered the sight lines for a child slightly reclined in a stroller. They employ iTouch devices to allow parents to pay at the point of sale at the "customized cars" station, so kids don't have to wait in line to pay after spending 15-20 minutes building their unique car. They have truly put themselves in children's shoes and minds to design the store experience. All retailers need to do this, while remembering to also cater to the parent who ultimately is making the purchases. As the father of two young girls, I'm dismayed (but not that surprised) by the news that Abercrombie and Fitch chose to market padded, "push-up" bikini tops to girls under the age of 10 this week. Naturally, a firestorm of criticism ensued. The company responded by removing the term "push-up" from the product description, though it continues to sell the item. As I read about this situation, I wonder what's going on inside of the company. One interpretation of this type of situation is that it is clearly an intentional strategy to achieve a high degree of free public relations. There's no such thing as bad publicity, I guess. Another interpretation is that they simply have a hard time assessing what constitutes "crossing the line" given that they are always dancing so close to that line with their marketing strategies. We simply don't know which interpretation is correct in this case. The second interpretation strikes me as interesting though, as we ponder the lessons for other companies from this episode. If you are a firm that chooses to dance close to that line of "appropriateness" at times, I would argue that you should have extensive discussions within your organization about the criteria that folks should apply when making brand decisions. You should have a process to vet particularly controversial decisions. Moreover, you should have some feedback built into your product launch process from the very groups that are most likely to be offended by controversial moves. Finally, it might be a good idea to have a devil's advocate who argues against launch in these controversial cases to make sure that you have thought through all the possible risks and consequences. Does Public Announcement of Goals Decrease Effort? My former student Luke Bornheimer (now working at Google) pointed me to some fascinating new research on goal setting. New York University psychologist Peter Gollwitzer and his coauthors have studied the impact of announcing your goals publicly. Conventional wisdom suggests that such public pronouncements propel you to work harder to achieving your objectives. However, in an experiment with law school students, the scholars found that those who maintained their goals privately tended to exert more effort than those who disclosed their goals publicly. The authors then conducted a second experiment. They were shown photographs of Supreme Court justices. The photographs differed in size. The experimenters asked the students: "How much do you feel like a jurist right now?" Those who publicly announced their goals picked larger photos. Psychologists previously have shown that selecting larger pictures demonstrates a connection to one's sense of identity and wholeness. According to the article, the second experiment suggests that, "Simply stating a strategy for becoming a good lawyer made them feel like they were real lawyers, and this inflated self-image paradoxically made them less hard working. They had become legends in their own minds, and legends don't have to get down and dirty." I'm fascinated with the result, and I look forward to seeing more research in this domain. Naturally, the results have implications for business leaders as well as students, and they even have relevance for our personal lives. I read a great article about SodaStream in Fast Company this month. I had no idea that the firm was 104 years old when current CEO Daniel Burnbaum took over. I thought it was a start-up from the past few years. For those who are not familiar with the company, it sells a countertop machine that enables families to make their own soda. The firm has seen its business skyrocket in the past few years. What is interesting about the firm's revitalization and growth? Four issues jumped out at me. 1. Burnbaum says, "The first thing we did was change the mind-set of the product from functional to lifestyle -- an object of desire. That kitchen counter is some of the most expensive real estate in the world." 2. They borrowed the concept of a razor-and-blades business model from other industries. They don't just make money off of the machines. They make money off of the CO2 refills, the flavor syrups, and the bottles that they sell. Complementary products are key. 3. They have marketed the green advantage with their product. After all, using SodaStream means not having to buy products from large beverage companies which require all that packaging. 4. The company made their products healthier, capitalizing on the wellness trend. What a terrific strategy. It really hits on a number of different trends, and it provides a sound economic model for the business. Recently, I read an interesting article in the Boston Globe about the Men's Zone experiment at retailer H-E-B. With the help of Proctor and Gamble, the retailer created a "store within the store" for men. The aisle contains more than 530 grooming products for men, ranging from razors to body wash. Males can find their grooming products without having to hunt through lots of women's items. Interestingly, the article suggests that women like browsing the aisle as well. When they are shopping for their husbands, they can find items more easily... and they aren't hunting through men's items when they are doing their own shopping for women's products. It's a win-win situation. We see more and more retailers creating "store within a store" concepts these days. They offer a way to provide an enhanced shopping experience. Moreover, they potentially offer a way to differentiate their retail shopping environment from rivals' locations. Most people put on the hard sell, backed by passion, persistence, and data. However, Conger argues that such an approach may not be appropriate in all circumstances. He explains that leaders sometimes need to approach persuasion as a learning and negotiation process. They must start by establishing their own credibility. Then, they must determine and explain the benefits for the other party of whatever course of action has been proposed. They must provide evidence to support that assertion of mutual benefits, but they also must connect emotionally with the people they are trying to persuade. This alternative approach focuses on trying to understand the other side's point of view, to step into their shoes, so as to learn how and why they are willing or unwilling to support your position. Persuasion occurs through giving them a sense of ownership in the solution that has been developed. Many people have heard about the famous rule of thumb regarding the "10,000 hours" required for someone to become an "expert" in a field. Gladwell wrote about this notion in his Outliers book. The notion of deliberate practice has been studied extensively by K. Anders Ericsson and his colleagues. They have documented how star performers in music, sports, chess, and the like are not simply born. They are made, in the sense that they engage in thousands of hours of what they describe as deliberate practice. Deliberate practice consists of extensive repetition of the very same activity, so as to hone a particular skill. It emphasizes focus over variety in the building of skills - i.e. working on one thing at a time. Famous tennis instructor Vic Braden has said, “Losers have tons of variety. Champions just take pride in learning to hit the same old boring winning shots." Moreover, deliberate practice means paying close attention to your technique, not simply the results you achieve. Does deliberate practice apply to business? It certainly does. As individuals and organizations, we engage in many activities repeatedly over time. We can become more deliberate in the way that we engage in those activities, with more focused reflection on process, not just outcomes, so as to improve over time. In recent years, a great deal of research has taken place with regard to one potential pattern of dysfunction that can occur in highly diverse teams. Researchers have discovered that individuals within a demographically diverse team often gravitate toward others with similar demographic characteristics. Thus, subgroups naturally emerge within teams. Actually, since individuals are actually bundles of demographic characteristics, we may "join" multiple clusters within a team. Gradually, we begin to see "in-group" vs. "out-group" dynamics unfold in some of these situations. "Fault lines" constitute the divisions or cracks that emerge within teams on these occasions. As a result of these fault lines, interpersonal conflict may occur, and information sharing may bog down. As a leader, you must learn to diagnose a team situation, looking for potential fault lines. If you can assess the probability that they may occur, then you can address the situation proactively before major stress and conflict take place. I think educators have to take this criticism to heart. We need to encourage our students to ask the "big questions" - as one of my colleagues told me the other day. We have to encourage them to challenge and probe, not just to memorize and regurgitate. That also means, however, that faculty have to stop advocating their own philosophies and ideologies, and focus instead on allowing the students to explore in a safe environment. Knowledge @ Wharton has a great column on Salman Khan's impact on education. Khan, the hedge fund analyst turned education innovator, gave a TED talk recently. The video is below. Khan has attracted a great deal of attention with his wonderful short educational videos that he provides for free online. He has produced more than 2000 of these videos, and he's attracted fans from parents of middle schoolers to Bill Gates. In this talk, Khan reports how teachers have contacted him to talk about how they are using his videos. Some teachers actually encourage their students to watch the videos at home, and then they are using the classroom time to have the students work on problems individually and collaboratively. What a fantastic reversal of the traditional approach! The lecture has moved out of the classroom, and the teacher-student interaction focuses on active learning in the form of problem-solving. In the past, the teacher lectured in class, and the problem-solving became homework. More educators should experiment with using this type of approach. 2. Leadership is the act of a lone genius. 3. Leaders must be charismatic extroverts. 4. Leadership requires formal authority. 5. All great leaders have a common set of personality traits. Joanne Chang Coming to Bryant! 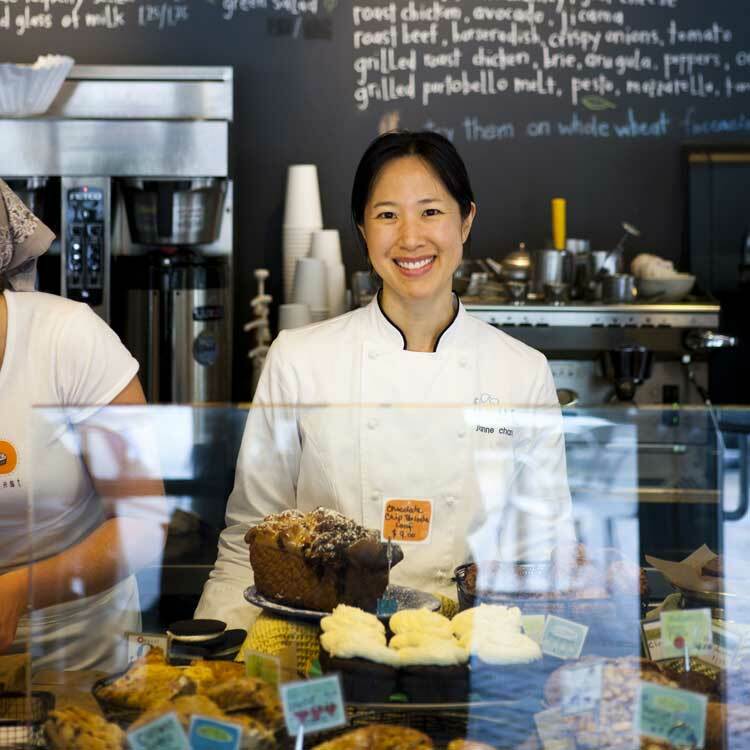 Joanne Chang, founder and owner of the Flour Bakery Cafes in the Boston area, will be speaking at Bryant. Chang, a friend of mine from Harvard College, also co-owns the Myers and Chang restaurant in Boston. She has been named Entrepreneur of the Year by the Boston Chamber of Commerce. Her new cookbook has become a best-seller, driven in part by appearances on the Today Show and Martha Stewart. Some of you also may have seen her a few years back, when she defeated Bobby Flay in his "throwdown" on The Food Network. We can't wait to hear Chang's entrepreneurial story. The event takes place at 6pm on Wednesday, March 23rd in Bryant's Bello Center. The public is welcome. The Wall Street Journal reports that Starbucks has struck an agreement with Green Mountain Roasters. Starbucks will sell pods of its branded coffee for Keurig single-serve coffee brewing machines at various supermarkets, club stores, and the like. Starbucks may soon sell the K-Cup pods and Keurig machines at its stores and through its website as well. Some rumors had swirled that Starbucks might even acquire Green Mountain, but in the end, a contractual arrangement took place. I find this development interesting in light of yesterday's blog post about GM deciding to acquire a sub-prime lender. GM had been working with an outside finance company, but chose to acquire it. Starbucks chose to go the route of partnership and contractual arrangement, rather than acquisition. Starbucks may have concluded that they can achieve most of the benefits of cooperation without the costs associated with doing a deal and subsequent acquisition integration. Now, they may eventually choose the acquisition route... this may just be a step toward even closer cooperation. Starting with this cooperative arrangement seems like a good "real option" approach. In other words, let's make an investment now in a partnership with the option of coming closer together down the road. Let's first learn about each other and get to know one another first. Perhaps too we'll learn we can cooperate perfectly well without having to integrate fully. Mr. Akerson (GM's CEO) has green-lighted a drive by other top executives, including Mr. Ammann, to rebuild an in-house auto-finance business, a move Mr. Liddell has voiced some doubts about. "I am philosophically against having a $100 billion finance company attached to a $50 billion to $60 billion car company," he said in January. "In a [market] downturn, we might be exposed. It's critical we have credit flowing through those times." I've also wondered about the move into auto finance. After all, GM used to be in this business (GMAC), and it divested the unit amidst many problems. Why does an automobile company need to have an in-house finance operation? Many auto firms do, but that does not mean it's the optimal strategy. Should GM really be making subprime loans with an in-house credit arm? Could the sales resurgence be driven, in part, by making credit available to some folks who will have a hard time repaying the loans? The article goes on to explain that, "The two companies have had a financial relationship for years. AmeriCredit, which already works with about 4,000 GM dealers, now gets about one-third of its business from financing new and used GM vehicles, GM said." That comment actually intrigues me, because one has to then question why GM needs to acquire the firm in order to accelerate sales. When a merger occurs, we should always ask: Why do these firms need to join together to cooperate? Why would a simple contract not do the job just as well? In this case, these firms appeared to be cooperating and working together quite a bit. What is it about that arrangement that was insufficient? Why the need to now merge? Across the nation, a debate continues to rage over teacher quality. Questions abound. Should we abolish tenure? How can we make it easier to fire poor teachers? Should we eliminate seniority-based rules for dismissing teachers? Don't we have to increase pay to attract better teachers? Some people defend the current system, arguing that it will be even harder to attract people to the teacher profession if we reduce job security substantially. They argue that the job security helps to offset the low compensation. I think these defenders of the status quo miss a very important point. People do not only put forth effort based on extrinsic motivation (pay, benefits, etc.). Clearly, intrinsic motivation also drives people. Ask yourself this question then: If a high quality teacher watches as a system protects incompetence around them, would it decrease their intrinsic motivation? Of course it would! Thus, I would argue that creating a system that is more meritocratic will help attract, retain, and motivate high quality teachers better than a system that protects those who aren't doing their job well. The CEO Has a Daughter: Shrinking the Gender Wage Gap? Knowledge@Wharton profiles some fascinating new research by David Gaddis Ross, Michael Dahl, and Christian Dezso. They conducted a study in Denmark on the pay gap between men and women in various businesses. Specifically, they examined whether the gap grew or shrunk after a company's CEO had a daughter. They found that the gender wage gap decreased at firms after the CEO welcomed a daughter to the family. The birth of a son did not have a material effect on the pay gap between men and women in the organization. First-born daughters had a more substantial impact than the following children. The study suggests that the birth of a daughter causes a CEO to adopt a different perspective with regard to women in the workforce. The result does not strike me as surprising, but proving the point with data clearly constitutes a major contribution. As someone with two daughters, it certainly makes me consider how my attitudes and actions have changed since their births. Will a new NFL Collective Bargaining Agreement Lead to More Inefficiency? In a study conducted several years ago, Cade Massey and Richard Thaler found that high draft picks in the National Football League are overvalued. In other words, teams seem to give up too much for top picks, particularly given the high financial cost and the uncertainty regarding whether they will turn out to be good players. Ryan Leaf and Peyton Manning were selected at the top of the NFL draft and received similar contracts. However, one turned out to be a Hall of Famer, while the other was a complete bust. One can trace the improper valuations of top draft picks to the famous chart developed by the Dallas Cowboys organization during the early 1990s. That chart enabled Jimmy Johnson and Jerry Jones to quickly assess the value that they should seek in return when making draft trades. Chart usage spread quickly throughout the league. Unfortunately, the chart caused people to give up too much for top draft choices! Why bring up this research today? Well, I began thinking about it again as I considered the implications of a new collective bargaining agreement in the NFL. The owners are pushing hard for a new salary scale for rookies, which would significantly constrain their pay. If they achieve their goals, then I wonder how this will affect the efficiency of the draft trade market. Will teams recalibrate their trading philosophies in light of the new wage scale? How long will it take for teams to adjust? Will some teams be more adept at adjusting the value that they place on high draft picks? I can see a new study in a few years examining how teams adjusting to a new financial reality. My guess is that it will take some time for teams to adjust properly, and some teams will clearly do better than others. Fortune has an article in the current issue about Old Rip Van Winkle Distillery. The small company makes fine aged bourbon. It only sells 7,000 cases per year. Demand appears to be much higher than that, and people are willing to pay a premium price for the product. The firm raises annually. In fact, some stores hold the bottles under the counter for particular customers, and they sell it at much higher than the usual retail price. What's the key to this type of scarcity strategy? As the article points out, two factors must be kept in mind. First, you must resist the temptation to increase production dramatically, because you might dilute the brand. Second, you must have a strategy for promoting your product that is fairly inexpensive. After all, the small size of the firm makes it difficult to justify a large advertising and promotion budget. Interestingly, social media has raised the possibility of creating a profitable small firm with such a scarcity strategy. Social media provides a way to raise product awareness very inexpensively. Exclusive in-person events, such as distillery tours and workshops, also provide a way to educate buyers about the value of your product. Finally, small firms can partner with related complementary products that also have an air of exclusivity and a high quality image. The Wall Street Journal had an article yesterday about how top MBA students around the country struggle to write well. Every educator and student should read the article. I did find it a bit humorous, though, that one writing instructor offered the following advice. For one assignment, students at a particular university had to write a persuasive email in 150 words or less to an executive regarding a marketing strategy. The instructor noted that students have a hard time making a concise, compelling point. They waste words and do not get right to the core issue. He advises that the memo should begin, "The single most important issue here is...." I cringed when I read the advice. What do I always tell students? Use the active voice, not the passive voice! Yet, here the instructor advised the use the passive voice in the very first sentence. In a 150 word memo, the passive voice surely means the inclusion of many extraneous words. 1. Use the active voice as much as humanly possible! 2. Keep your sentences short and simple. Avoid long compound sentences. 3. Keep your paragraphs relatively short as well. 4. Use colons and semicolons sparingly. 5. Don't end your sentences with a preposition. 6. Use the word "however" properly, i.e. not as a conjunction! 7. Explain and interpret charts and graphs for the reader, and do not include extraneous figures that distract from the main point. Mark Pasetsky writes over at Forbes.com about a lesson we can learn from Kim Kardashian regarding the effective use of social media. Pasetsky explains that Kardashian has been providing "exclusive" info to her Twitter followers building up to the release of a new album in a few days. The tweets either provide information directly, or drive fans to her blog to reveal additional information. While we may not be fans of Kardashian, we can take a lesson from this example from Pasetsky. A social media campaign should be thought of as a process that begins well before the actual launch of a new product or service. Staged correctly, a series of actions via social media outlets can help build up to a very successful launch. That type of campaign can be far more effective than a series of Tweets, blog posts, and the like that all hit on the day of, or immediately after, a new product introduction. 5 Crucial Customer Satisfaction Factors, Not 80! Business Week has an article about how companies are using "sentiment analysis" to examine how customers are feeling about their brands and products. This new form of business intelligence mines social media platforms, blogs, and other sites on the web to gauge how consumers are feeling in real time about a firm. What actually struck me about the article, though, was an example regarding Gaylord Hotels. Gaylord operates upscale hotels particularly designed to host meetings and retreats. Through this type of research, Gaylord learned about 5 critical factors during the first 20 minutes of a guest's stay that a substantial impact on their satisfaction. Interestingly, in the past Gaylord had operated with a list of 80 items that it felt were crucial to a guest's visit. Think about that - 80 factors! Imagine a hotel staff member trying to optimize 80 attributes of a customer's experience. Surely, no manager could remember 80 factors. To me, the best part of this story is that Gaylord was able to hone in on 5 items. By creating more clarity and focus, they were able to really drive performance improvement. Every company should go through that type of exercise to streamline their metrics and get everyone focused on a few high priority items with regard to customer satisfaction. It's just like asking a student to read for class. If I ask them to read 300 pages, they are likely to throw up their hands and read none. If I ask them to read 10 very important pages, I might actually get them to do the work!